Last night, we morphed! 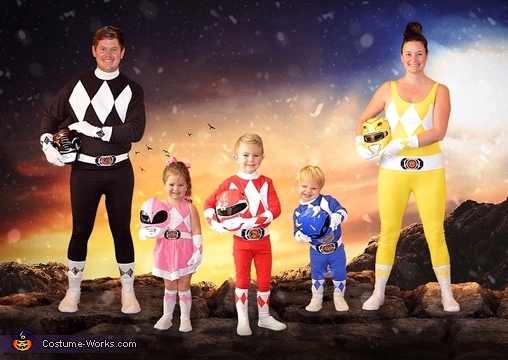 When our oldest son (age 5) said he wanted to be the red Power Ranger for Halloween I thought, "great, easy!". Wrong. Do you know how hard it is to find original Mighty Morphin Power Rangers stuff? Very. So momma got to work and started creating this image. Leggings, turtle necks, shirts, socks and leg warmers for the "boots", paint, spray paint to paint the black and yellow helmets since we couldn't find those in time, white cotton fabric, and my sewing machine. Quite a bit of time went into these but the outcome was SO worth it. We won Halloween and made our oldest sons day. All three kids were actually all about it and it made my husband and I so happy to see! Pictured is the Williams Family. From left to right, Jay, Evie, Aden, Watts, and Christine.